Easy access to all you moving needs with a single login. Automatic reminders to keep you organized. We connect you to local and long-distance moving companies. You can also get dozens of free moving quotes with just a click of your mouse. 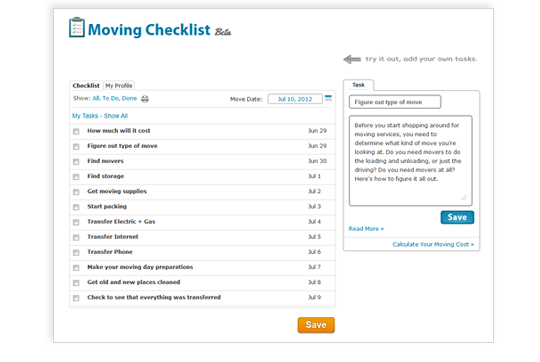 Create your own moving checklist, save your favorite articles, and use our moving calculator to price your move. Get real quotes from real moving companies. Then pick the right one for you. Learn how much your move will cost, right down to the moving boxes. Moving can get complicated. Use our moving checklist to stay organized. We have an article on every moving issue. Have a question? Check here for the answer. Stay up to date with moving news and tips from our blog! Find a good apartment in a good neighborhood from your desk. Set up cable and electricity in your new home before you arrive! Get tips on everything from decorating to meeting new friends. We have a section devoted just to our service members' needs. How do you tip a mover? Learn this and more. Save your bank account by following our cost-saving advice. 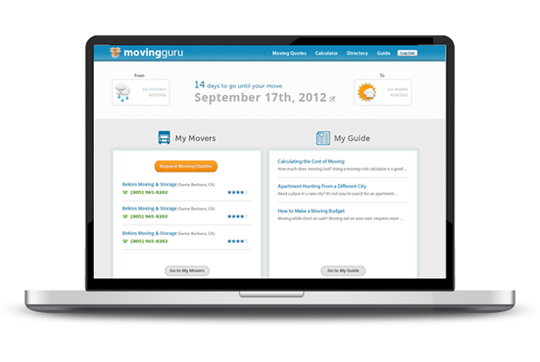 Welcome to MovingGuru.com, your one-stop moving and relocation portal. We will guide your move from the day you decide to relocate until the day you’re settled in. All you need to do it follow along – our services are 100% free. For no cost, we will connect you to local and long distance moving companies who can move you from and to any city in the United States. Compare up to six free online moving quotes from real moving companies. Also, find self-storage facilities to keep your stuff safe during your transition. All of our partner moving and storage companies are reputable, licensed and affordable. But we don’t just connect you with moving and storage companies – we help you figure out which ones are right for you. Our Moving Cost Calculator will help you budget your move with specific services in mind, and our Moving Guide offers a suite articles about how to find good interstate moving companies for the best price. If you are planning to move without the help of a long distance moving company, then make sure to read our Moving Checklist, which guides you through your upcoming move every step of the way. And check out our City Guide pages, which provide you with helpful insight and contact information about the city you’re moving to. 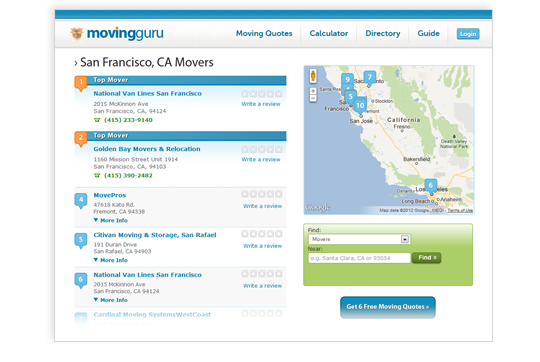 Here at MovingGuru.com, we work long nights and heavy weekends to make your move as easy, predictable and cheap as possible. Take advantage of our efforts.